Husky 33 gallon Air Compressor equipped with a 1.7 HP engine and oil-less aluminum pump. This 33 gal air compressor delivers 5.0 SCFM at 90psi and maximum pressure 150 psi. It features a high flow regulator which ensure more effective air to your air tool to provide maximum run time and performance. Due to the low-profile pump and engine shroud you can use more on-board tool and accessory storage. 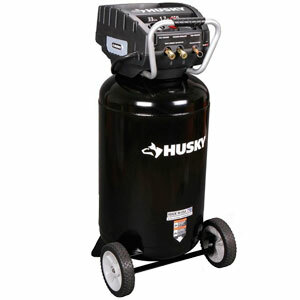 For greater portability Husky 33 gallon air compressor has 9 in. solid-rubber wheels. This air compressor can be your friend for a long time. It can helps to you almost in any task if you have additional air tools. With spray gun you can paint your fence really quickly. Appropriate Nail gun will be helpful to you on the roof, help to repair or create new fence, or fix mouldings. It noise level is near 87 dBA but customers are complaining that it is a bit noisy. So before buying ask the seller to test it in your presence. Delivers 5.0 SCFM at 90psi. Note, that this air compressor can be red or black color. If you want to write a Review about this product, you can use the form below.